TALK CLEAN TO ME: Measles at O’Hare Airport! A new year, signifies the start of a new tradeshow calendar of events meaning, I start packing my bags and booking flights. Traveling is a bit like Russian roulette, as once you walk in the front door of an airport you’re in close quarters on planes, trains, elevators, security lines and bathrooms. Heck let's face it, virtually any area of the airport you’re in you’re lucky to have a foot of free space around you. In the infection control world this is bad because we know respiratory droplets can travel. In fact a study I found from 2007 showed that respiratory droplets varied in how far they could travel depending on their size and how they “left” the body. They found that large droplets are carried more than 6 m away by sneezing, more than 2 m away when you're coughing and less than 1 m away when breathing normally. Hmmm, I say. I may need to invest in a bubble to wear when travelling. As I mentioned in my “Welcome to 2018” blog, you never know where the next outbreak may come. You may be wondering why I’m talking about airports and the distance respiratory droplets travel. 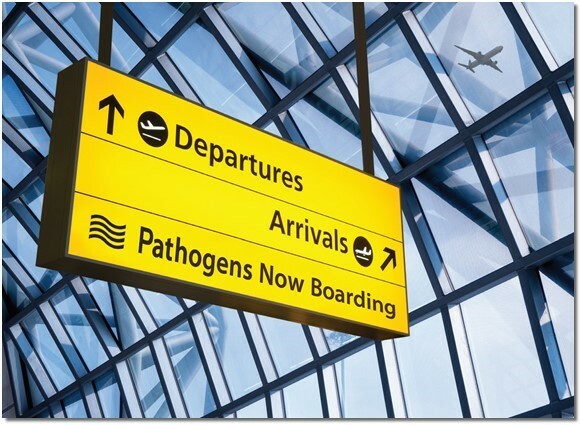 Well, if you haven’t heard, a passenger with an ACTIVE case of measles recently arrived (January 10th) at O’Hare Airport in Chicago. They arrived on an international flight landing into terminal 5 and departed on a domestic flight that left from terminal 1. For those that have been at O’Hare that leaves a lot of ground to cover, people to come in contact with and surfaces that could be touched. If one person with active measles is not bad enough, apparently a second measles infected person has been identified. This person arrived at the airport on January 9 (also arriving in Terminal 5) and also visited an office plaza and three suburban hospitals between January 10th and 13th. On a positive note, vaccination rates in children for MMR (the vaccine that covers measles) in the US is about 92%. The negative side, is that there is data now showing that twenty years after a second MMR vaccination, antibody levels for all 3 viruses in the MMR vaccine wanes. In Canada, MMR was introduced in 1983 which saw a significant decrease in the number of cases. In 1997, a two-dose vaccination protocol was introduced. This means there could be a number of adults who only received 1-dose of the MMR vaccination. If your GP does not routinely screen for antibody levels to some of the vaccine preventable diseases and you’re like me and only received a single dose in my childhood you may want to check out your antibody levels. I had mine checked a couple of years ago after an outbreak of measles at a university happened in a population of immunized students. My levels showed my immunity was questionable but with a quick shot to my arm I’m now completely covered! I will admit, I avoid O’Hare at all costs. I don’t have anything against the city of Chicago. I just don’t like missing connecting flights due to snow and rain storms that seem to be so prevalent in that part of the country! Under the weather? Under productive!